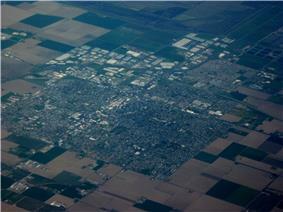 Woodland  is the county seat of Yolo County, California, located approximately 15 miles (24 km) northwest of Sacramento, and is a part of the Sacramento - Arden-Arcade - Roseville Metropolitan Statistical Area. The population was 55,468 at the 2010 census. Before the settlement of the area by people of European descent, the Woodland area was inhabited by the Patwin, a subgroup of the Wintun Native Americans. There are two main groups of Patwin: River and Coastal Patwin. Woodland's indigenous roots stem from the River Patwin who tended to stay closer to the Sacramento River, as opposed to the Coastal Patwin who lived in small valleys in hills and ranges. The Yolotoi, a tribelet of the Patwin, occupied area near Woodland, and settled a village northwest of Woodland and another close to present day Knights Landing. Although they didn't have a permanent settlement in present day Woodland, it is believed that the River Patwin occupied the Woodland area in seasonal camps for hunting and seed gathering. The Yolotoi and their neighboring tribelets had a main trading trail which followed Cache Creek. The exchange of goods between the neighboring tribes of the Nomlaki to the north, the Nisenan to the east, and the Pomo to the west also served as a way of cultural and social interchange between all the tribes. The simultaneous enslavement and spread of disease through the Patwin by the Spanish missionaries had quickly taken dramatic effects; a malarial epidemic in 1830-33 and a smallpox epidemic in 1837 killed much of the surviving natives. However, it has been found that some of the first farm hands in the earliest farms in Woodland were the Patwin people. In 1851, the year after California became a state and Yolo County was formed, "Uncle Johnny" Morris settled in what is now the corner of First and Clover Streets in Woodland. Two years later Henry Wyckoff arrived and built a store he named "Yolo City". This new Yolo City might have stayed a singular store if Frank S. Freeman had not bought it and acquired 160 acres (0.65 km2) of land in 1857 and began to develop a town that he hoped would be a trading center for one of the richest crop-growing areas in America. Freeman was giving land to anyone who would clear it and build their home on it. In 1859, Freeman suggested to the post office that the town be called Woodland and the post office accepted. Later, on July 5, 1861, the Woodland Post Office was established and Freeman was made the Postmaster. 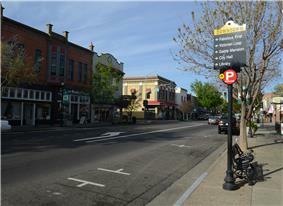 He lost no time in further developing the town by leasing or selling buildings for businesses to use. The 1860s was a time of opportunity for Woodland. The town had the county seat permanently moved to it after Washington, California (now a part of West Sacramento) had flooded. Schools, homes, churches, and a cemetery were built at this time. The town's newspaper, the Daily Democrat, and a post office were established, and most importantly the construction of a rail line. In 1869, the California Pacific Railroad Company constructed a line between Davisville (now Davis) and Marysville with a Woodland station in the area of College Street and Lincoln Avenue. The rail line expanded and was eventually acquired by Southern Pacific Railroad. The track was then relocated from College Street to East Street, the eastern edge of the city at that point. The addition of the railroad is what led to the expansion of Woodland as a town. Before the railroad people were building primarily on Main Street and northward. Now, expansion was heading westward and southern as well. 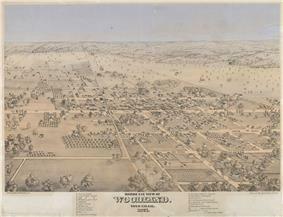 In 1870 the population of Woodland was estimated to be 1,600 people, 647 of which were registered voters. Signatures were being collected to petition for the incorporation of the town, a feat which was successful. The City of Woodland was incorporated in 1871 and its residents soon had a multitude of services such as regular train and telegraph operations, telephone services, gas, water, electricity, street lights, and graveled streets. Woodland's Chamber of Commerce was founded in 1900 in with the aim of helping business flourish in the city. During this time public activism helped Woodland get a library, a city park, and an improved cemetery. In 1910 Woodland was the most populous city in the county with a population of 3,187 and for the next forty years Woodland continued growing slowly but steadily in population, businesses and industries. Its economics were based mainly on agricultural related fields; three rice mills, a sugar beet refinery and a tomato cannery were built during this time. The post-war era spurred much growth in Woodland; between 1950 and 1980, Woodland's population tripled. It is rumored that in the 1950s Woodland had the most millionaires per capita of any city in California. Industrial plants and distribution centers have grown in the northeast, and there are new subdivisions and shopping centers around the town's area. Since the late 1960s, there has been an increase of interest in preserving the town's historic buildings, and an impressive number of them have been restored for use as homes, offices, stores and museums. Woodland's "Stroll Through History" began in 1989 to showcase many of the Victorian homes and other historical sites throughout the city in their annual event. In the 1970s Interstate 5 construction was completed and the freeway curves around Woodland. Over time, I-5 and State Route 113 have replaced the railroads as major transportation arteries. Woodland, as with the rest of California's Central Valley, has a Mediterranean climate with dry, hot summers and cool, relatively wet winters. The rainy season is generally from October through April. Average high temperatures range from 95°F in July to 55°F in January, while average lows range from 60°F in July to 39°F in December and January. February is typically the wettest month with about 4.42 inches (112 mm) of rain. All-time extremes for Woodland are 15°F and 114°F. Summer brings warm days with temperatures frequently in the 90s, but the "Delta Breeze" that blows into the valley through the Carquinez Strait usually makes for comfortable evenings and nighttime temperatures in the upper 50s. Occasional heat waves raise the temperature above 100 degrees. During late fall and throughout the winter months, Woodland experiences cooler temperatures, rain from storms originating in the Pacific Ocean and Gulf of Alaska, tule fog, and a few mornings of frost and freezing conditions. When the chilling fog does not burn off, daytime highs may remain in the 40s or low 50s for several consecutive days. Snow is extremely rare in Woodland; the last measurable snowfall occurred on January 28, 2002. Located about 60 miles to the east of Woodland, the Sierra Nevada mountains receive significant amounts of snow each winter. The cool and wet weather becomes much less frequent in April and May as the days gradually get warmer. There were 19,806 housing units at an average density of 1,294.3 per square mile (499.7/km²), of which 10,472 (55.9%) were owner-occupied, and 8,249 (44.1%) were occupied by renters. The homeowner vacancy rate was 2.0%; the rental vacancy rate was 6.1%. 30,543 people (55.1% of the population) lived in owner-occupied housing units and 23,940 people (43.2%) lived in rental housing units. As of the census of 2000, there were 16,751 households, and 12,278 families residing in the city. The population density was 4,765.7 people per square mile (1,840.7/km²). There were 17,120 housing units at an average density of 1,660.0 per square mile (641.1/km²). The racial makeup of the city was 48.5% White/Caucasian, 1.3% African American (1.3% by December 2006), 1.5% Native American, 3.8% Asian (7.4% by December 2006), 0.3% Pacific Islander, 21.5% from other races, and 4.9% from two or more races. Hispanic or Latino of any race were 61.8% of the population. There were 16,751 households out of which 40.1% had children under the age of 18 living with them, 54.8% were married couples living together, 12.9% had a female householder with no husband present, and 26.7% were non-families. 21.0% of all households were made up of individuals and 8.4% had someone living alone who was 65 years of age or older. The average household size was 2.89 and the average family size was 3.37. In the city the population was spread out with 29.7% under the age of 18, 9.6% from 18 to 24, 30.3% from 25 to 44, 19.9% from 45 to 64, and 10.5% who were 65 years of age or older. The median age was 32 years. For every 100 females there were 96.2 males. For every 100 females age 18 and over, there were 92.5 males. The median income for a household in the city was $44,449 ($50,309 in December 2006), and the median income for a family was $48,689. Males had a median income of $34,606 versus $27,086 for females. The per capita income for the city was $18,042. About 9.2% of families and 11.9% of the population were below the poverty line, including 14.0% of those under age 18 and 7.3% of those age 65 or over. Woodland and the immediate surrounding area's economy has largely been based on agriculture. To this day, Yolo County is one of the largest crop producers in the state. Similarly, the transportation industry has played a large part in Woodland's economy. With heavy agricultural production comes the need to transport it. While maintaining the large role that agriculture and transportation still play in the town's activities, over the years Woodland has branched out into other sectors as well. The industrial sector has grown in Woodland as is seen by the numerous manufacturing and warehouse centers. Modular homes are one of the largest manufactured goods in town. Several major retail stores have warehouses in Woodland or just outside of city limits. When the price of homes rose in California during the first half of the decade, Woodland was near the front of the wave due to many factors including proximity to Sacramento and its maintenance of a small community feeling. As a result, in 2002 Woodland had the highest percentage increase in property value in the nation. Ease of access to the city provided by the close proximity of I-5 and I-80 as well as the Sierra Northern Railway and the California Northern Railroad are most likely why businesses have done so well in Woodland. Woodland's proximity to the Sacramento and San Francisco metro areas also provide businesses another reason to set up shop in town. The First Friday Art Walk is a monthly event which promotes the work of local and international artists. The Yolo County Fair is held in Woodland in the middle of August each year, running Wednesday afternoon through Sunday evening. Started in 1935 (current site in 1940), it is the largest free admission fair in the state of California, and as such, people come from all over Northern California to enjoy this event. There are demolition derbies in the fairground's arena, local FFA and 4-H competitions going on, as well as several other agricultural related competitions. One of the newest and most popular attractions of the county fair is the "Yolo Idol Search" based on the TV show American Idol. There are also several exhibition halls where fair-goers can peruse through stands set up by local businesses and groups. In 2009 Woodland held the 134th annual Sacramento Valley Scottish Games and Festival. The festival has been held in Woodland for the past 12 years. The "Games" are the third oldest in the United States. It is also the second largest event in Yolo County. The Stroll Through History is a widely celebrated event in Woodland. It is used to increase awareness and appreciation of the history and heritage of Woodland. There are guided walking tours through several historic areas of Woodland, displays of historic equipment, vehicles, and other historical finds, as well as tours inside several of Woodland's historic Victorian homes. Some of the Stroll Through History is free while other parts require tickets purchased in advanced. This event usually takes place on a Saturday within the first two weeks of September. The Woodland Dynamite Chili Cook-off is a newer addition to Woodland's cultural activities. Beginning in 1998, the cook-off has drawn a lot of people out to try chili cooked from various members of the community. This event also includes other activities such as bounce houses, pony rides and games for the children; live music as well as other food and drink for the adults. The cook off is held the third Saturday of each September at Rotary Park in the Yolo County Fairgrounds. The City of Woodland and Woodland Chamber of Commerce put on a Christmas parade each year that draws a crowd of around 30,000 people in downtown Woodland. It is one of the largest holiday parades in Northern California. Started in 1964, the Woodland Christmas Parade now has around 150 entries each year, including marching bands, floats, dance groups, military units, and novelty entries from local groups as well as from the surrounding area. The parade runs through Woodland's "Historic Downtown", along Main Street beginning at the intersection of Main Street and California Street and ending at the intersection of Main Street and 6th Street. In 2008 The Sacramento Valley Scottish Games & Festival celebrated its 11th year at the Yolo County Fairgrounds. The Games feature a wide variety of activities, drawing up to 20,000 visitors each year. The Games are held the last Saturday and Sunday of April. The annual Hot Rod Reunion car show event occurs every summer. The upcoming 16th Annual Hot Rod Reunion will take place on Saturday, May 2, 2015. This year they are going "Back to the Street" and will be hosting our annual event on Historic Woodland Downtown Main Street in Woodland, California. There are several small museums in Woodland. 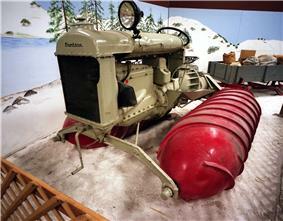 The Heidrick Ag History Center is an agriculture and transportation museum. It showcases rare and unique agricultural machinery and vehicles dating from the late 19th century to the middle of the 20th century. It also has a 45,000 square foot events and exhibition hall which includes rotating exhibits. Reiff's Antique Gas Station Automotive Museum has car culture exhibits from the 1950s and 1960s. The antique gas station displays old fashioned gas pumps, gas station signs and logos. Additional exhibits include the old time general store, diner and movie theater. Another local museum is the Yolo County Historical Museum. It is located on 2.5 acres (10,000 m2) in the former home of Woodland pioneers William and Mary Gibson. The construction of the house itself was started in 1857 and is listed on the National Register of Historic Places. The museum acquired the property in 1975 and it houses furnishings and artifacts dating from the 1850s to the 1930s. Locally called The Gibson Mansion, the house and the property depict everyday living from that era as well as changing exhibits regarding Yolo County history. Another site of interest is the Woodland Public Library. The original structure was funded by Andrew Carnegie and was constructed in 1905. The Woodland Public Library is the oldest library funded by Carnegie in California that is still in operation. One of Woodland's prized possessions is the Woodland Opera House. It is a California Historical Landmark and a California State Historic Park that was originally built in 1885 and was rebuilt due to fire in 1895-1896. The opera house was rebuilt on the original site with some of the intact bricks and foundation. It was the first opera house to serve the Sacramento Valley. Some notable performers on its stage include John Philip Sousa and his band, Verna Felton, and Madame Helena Modjeska. Closed in part due to the rise in the motion picture industry, and partly due to a lawsuit involving an injury, the opera house was closed in 1913 until recently. Renovations allowed for the historic building to be opened up again and it is now an acting venue in town. Several major productions are shown throughout the year and many bands use the venue. Woodland was incorporated as a general law city, governed by a five-member council, with the mayor serving as presiding officer. The mayor and four council members are elected officials, serving four-year terms. The council selects the vice mayor based on the member who received the greatest amount of votes. This council member then serves as mayor during their last two years of office. Day to day, the city is run by a city manager, and has 376 permanent staff positions. In the California State Legislature, Woodland is in the 3rd Senate District, represented by Democrat Lois Wolk, and the 4th Assembly District, represented by Democrat Bill Dodd. In the United States House of Representatives, Woodland is in California's 3rd congressional district. ^ "City Council". City of Woodland. Retrieved September 18, 2014. ^ a b "Statewide Database". UC Regents. Retrieved January 27, 2015. ^ a b "Woodland (city) QuickFacts". ^ "Human History - The Patwin". ^ "Target Store Project - Cultural Resources" (PDF). City of Davis. February 2006. p. 4. Retrieved 2008-12-21. ^ Thayer, Robert L. Jr.; Jacob P. Mann (2000). "Traditional Native American Territories" (PDF). Retrieved 2008-12-21. ^ a b c d e "A Brief History of Woodland" (PDF). 1996 General Woodland Plan. City of Woodland. 1996. Retrieved 2008-12-16. ^ a b c d e f Walters, Shipley. "A Brief History of Woodland". Woodland Stroll Through History. Retrieved 2008-12-16. ^ Erwin, Gudde (2004). California Place Names: The origin and etymology of current geographical names. Berkeley, CA: University of California Press. p. 426. ^ a b c Three Maps of Yolo County. Woodland, CA: Yolo County Historical Society. 1970. p. 8. ^ "About Woodland". WoodlandCommunity. Retrieved 2008-12-21. ^ "2010 Census Interactive Population Search: CA - Woodland city". U.S. Census Bureau. Retrieved July 12, 2014. ^ "Report to Council on Findings of Yolo County Fair Report" (PDF). City of Woodland. June 10, 2008. p. 1. Retrieved 2008-12-24. ^ "FAQ". Stroll Through History. Retrieved 2008-12-25. ^ "Event History". Woodland Dynamite Chili Cook-off. Archived from the original on May 6, 2008. Retrieved 2008-12-16. ^ "Woodland Parade needs assistance". The Daily Democrat. 2008-11-28. Retrieved 2008-11-28. ^ "Caledonian Club of Sacramento". Caledonian Club of Sacramento. Retrieved 2008-12-16. ^ "History of the Museum". Yolo County Historical Museum. Retrieved 2008-12-25. ^ "Woodland Public Library". City of Woodland. Retrieved 2008-12-16. ^ "State Historic Woodland Opera House Expansion Memorandum" (DOC). April 17, 2008. pp. 2–3. Retrieved 2008-11-22. ^ Wilkinson, David. "Brocchini Architects". Crafting a Valley Jewel: Architects and Builders of Woodland. Woodland, CA: Yolo County Historical Society. pp. 160–161. ^ "Human Resources". City of Woodland. Retrieved 2008-12-16. ^ "Communities of Interest — City". California Citizens Redistricting Commission. Retrieved December 6, 2014. ^ "California's 3rd Congressional District - Representatives & District Map". GovTrack.us. Retrieved February 28, 2013. ^ "About WJUSD". Woodland Joint Unified School District. Retrieved 2008-12-16. ^ "Letters from a Killer Filming Locations". The biggest medical facility in town is Woodland Healthcare, a member of Dignity Health. Other facilities include Sutter Health and private practices. Woodland receives its natural gas and electricity services from Pacific Gas & Electric. The City of Woodland provides water utility services and Waste Management deals with waste services in the town. Most transportation is done by automobile, but because Woodland is still a relatively small community, it is easy to find people walking or riding their bicycle instead of driving. Main Street, Woodland's "Historic Downtown" is a perfect example of where it is easier to walk a short distance than it is to drive, due to the frequent intersections and small streets. Woodland is served by Yolo County Transportation District commonly termed 'YOLOBUS'. There are many routes to and from Downtown Sacramento, Davis, Cache Creek Casino Resort, and other areas of Yolo County. Two freeways run through the city, State Route 113 and Interstate 5. Many of the surface streets in town run north and south or east and west definitively. The roads (especially in the older part of the city) are straight, and the city is therefore made into a grid with the intersecting streets. Big Love Season 3 is was partially filmed in the city of Woodland, California. The cast and crew of the HBO series Big Love descended on Woodland as part of a weeklong filming stint that took them all over Yolo and neighboring counties. The documentary, "Bigger, Faster, Stronger" features several scenes in Woodland, and includes interviews with football players from the Woodland Wolves and the Pioneer Patriots. Several movies have also been filmed, at least partially, in Woodland. They include the movies Farewell Bender, Blood Sport, Letters from a Killer, and selected scenes from Three Men and a Baby. The local newspaper of Woodland is the Daily Democrat. It was established in 1857 before the City of Woodland was incorporated. The Sacramento Bee is also widely read in town. The WAVE (Woodland Access Visual Enterprises) Channel 21 is Woodland's Public-access television cable TV station which airs footage from a variety of community activities. Some examples are local high school football games, the Yolo County Fair, the Woodland Christmas Parade, as well as televised classes from Woodland Community College Educational-access television program. Anyone from the community is able to air approved content. Yuba Community College District oversees Woodland Community College, a now fully accredited college. There are several private schools in town. They include Woodland Christian School, a former ministry of the LifePointe Church (formerly known as First Baptist), which offers classes for children from preschool through high school; Holy Rosary Parish School, ran by Holy Rosary Parish, offers enrollment from preschool to 8th grade; Montessori Children's House offers enrollment from preschool through 6th grade; Woodland Adventist School gives classes from preschool to 8th grade; a private school entitled Abby's School has enrollment for preschool and kindergarten; and Cornerstone Christian Academy using A.C.E. 's School of Tomorrow curriculum, offers classes for pre-school through high school aged students.